New Lexington head boys basketball coach Elliott Pope shakes hands with Bailey Harris who stepped down from that position after 32 seasons. 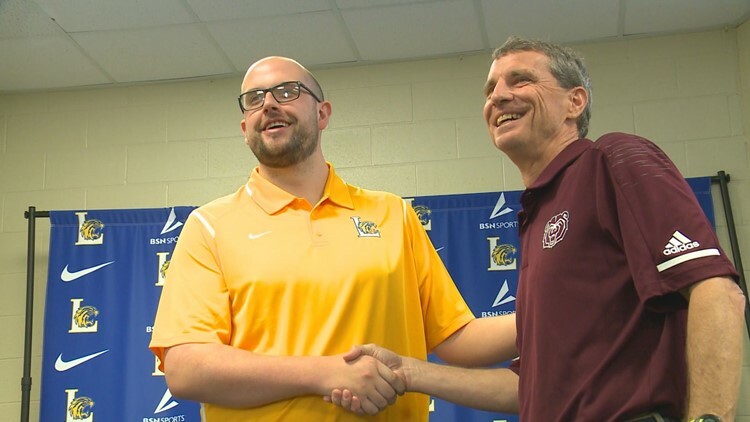 Elliott Pope was introduced Thursday as the new head boys basketball coach at Lexington. It's not easy taking over for someone who spent 32 seasons at the helm with two state championships and 637 wins. But that is the challenge Elliott Pope has embraced. The Huntersville, N.C.native has been at West Davidson High School in Lexington, N.C. for the past two seasons. He went 19-29 record and was named the Central Carolina Conference Coach of the Year this past season after a five-win improvement. Pope also served as athletics director and boys basketball coach at Mountain Island Lake Academy in Charlotte and the junior varsity coach at Concord High School. His wife is a native of Columbia and wanted to get back home. For Pope to be able to take over a 5A program that is rich tradition was a bonus. "As far as what I will personally bring, we will work closely with (Athletics) Director Woolbright and Principal Rawl to make sure we're doing the best for our student-athletes," Pope said. "But ultimately, I think the biggest thing is going to be passion and a strong influence on the game to develop our student-athletes here at Lexington."